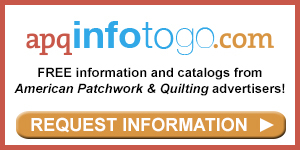 "Hi, I'm Jennifer, here at the American Patchwork & Quilting sewing lab with Handi Quilter ambassador Angela Walters. And we're talking about geometric quilting designs. Now geometric quilting designs are really the hallmark I think of the modern quilting movement, but traditional quilters like to use them as well for quilts that they maybe want a more masculine feel on. So let's talk a little about what some of those designs might be." "First we're going to talk about the geometric allover design. This is one of the first free-motion quilting designs that I learned almost 10 years ago. It's very beginner friendly. You don't have to worry about getting yourself caught in a corner because you can just cross over those lines. And like you said, it adds a nice geometric look to the quilt." "It's sort of the modern version of stippling." "Pretty much. And then we're going to talk a little bit about square chains where to take that same boxy shape and just make it a bit more regular and fill in shapes that way." "Great way to use it in a border." "Absolutely. And then we'll talk about how to offset those shapes to give it a different look." "Let's get started." "So first, the geometric allover. We talked about how this is great for beginners because you don't have to worry about getting yourself stuck in a corner. You can also scale up the design however works best for your quilt. So if you want to make it larger as an allover or shrink down the design and use it as a filler behind blocks, that works well, too." "Do you worry about getting those points on your corners as you're getting those boxes?" "That's a great question. I don't worry about having them perfectly be pointed, but I know that some people really do like that look, so what I'll express to my students is when you're going into those corners and you're making that kind of right-angle turn, you want to hesitate in the corner for just a fraction of a second to let it take that stitch right there and that's what will give it that nice, crisp corner. Also, if you're using a stitch regulator, you want to make sure you hesitate there just a moment to let it make that stitch. If you don't, you'll get a little bit more of curved look (which I like to quilt fast, which is how mine end up looking, so I just say that it's a design choice). But if you're wondering why it's not looking so crisp on the corners, try taking that hesitant little break." "I also have a need for speed, so that's good advice." "Absolutely. A lot of people think they have to use rulers for something like this, which I do use a ruler from time to time. Here's an example of a ruler you would use on a long-arm quilting machine. However, for these designs, I wouldn't worry about it. It's small lines, you're not going very far, and if you had to stop and readjust your ruler for every turn, you're going to be slowed down quite a bit. So for this example, we won't use any rulers." "And you're stitching in a lot of different directions. The one thing I'll say about rulers is that this is specifically made for long-arm machines. It's not your typical ruler you'd use with a rotary cutter. I think that's a common mistake people sometimes make." "What makes a difference is that it's a little thicker, so it won't go under your hopping foot." "Well, let's start stitching." "Yes. Ok, on the machine I have an example of a more geometric type quilt. It's actually a panel. And we'll just start with the geometric allover design that we talked about. And we'll do it like it's a filler." "One of the things I think people don't start thinking about their quilting early enough in the process. And really it's something you should consider as you're getting your top pieced. What do you want your quilting to look like? Do you want that geometric quilting to mimic the block shape like when we have a square-in-a-square design here? Or do you want it to contrast? Do you want something curved on a quilt with a lot of sharp edges and angles." "There's no wrong answer. It's just whatever you like. But having that idea before you get started will make you more comfortable quilting, because you'll already have a road map." "So let's start with the geometric allover, and basically I'm just quilting boxes that that. And continuing past and going into the next. And I'm taking my time and hesitating just a moment at those points to give me those nice, point, sharp corners. And you can just work your way around the quilt. If you get stuck in a corner, you don't have to worry about it, because you can just work your way back down or even cross over this if you needed to." "And I love that you're varying the shape or your boxes. They're not all the same and you're not worrying about that." "Absolutely. And I like it better when it's a little bit of a different shape. And I also want to try to be mindful that I'm not going in the same direction. I like it when it meanders or looks different -- where you can't tell exactly where you went. But again, that's just my preference. Other people might have different preferences. So that's a nice, speedy quick way to quilt a geometric allover. But if you take that same shape and quilt it a little bit different, you could have what I like to call a square chain. You quilt the outside of a square and you're working your way in until you get to the center. Now when you're all the way to the center, you're not going to stop like I did, but you're actually going to right across the lines into the next one. And this is the thing that people are always like 'Oh, she crossed the lines,' but if you do it on purpose then it's totally ok." "Right, we always say these rules are all made up anyway., so make up your own rules." "Exactly. So, I just going to cross right over and go right into my next shape. Now for this example I'm keeping them all pretty much the same size, but could definitely vary the spacing or the size of it. This time I'm going to go down. And I've just taken that line out where I need to go and working my way in. And if you were working in a block like this, you could do the same thing. Just use the edges of that block as a guide and fill in with that design." "I love that look." "This is one of my favorite designs because it's easy, but I think it looks really interesting, and that's kind of the Holy Grail of quilting. So let me show you how you can offset these a bit. What I'm going to do is I'm going to quilt one and I'm going to space and then I'm going to quilt another. Let me show you what that looks like. So again, I'm not using a ruler. I have a light grip on the machine, and I'm just hesitating in those corners a bit. They're not perfectly straight, but I'm ok with that." "I learned in class that you should really be holding the handles like you're holding an ice cream cone as opposed to having the death grip that you have on the steering wheel when you're sliding on ice." "Yes. 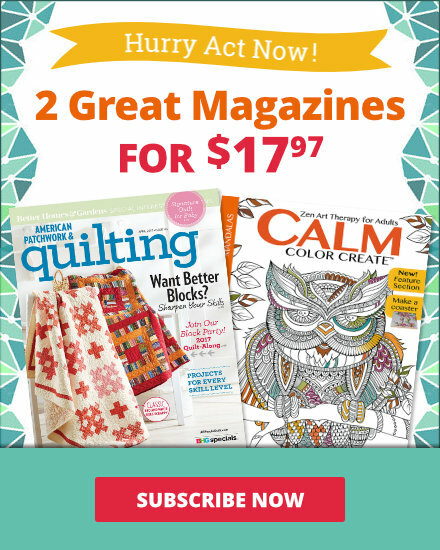 You're not going to help your quilting any by gripping it. You're just going to hurt your arm. Then I'm going to come down here and fill in this space with a square. So I'm just filling in that space with another square and then coming over underneath that first one there. So I have my row up here with this one filling in between them. And now I'm just going to continue that. Since I have this space here, I'm just going to throw in another one of those square chains. Again, I'm not worried too much about keeping it perfect. I'm just going for it." "So you could do this as a border or you could do it overall across your quilt top." "You can do it both ways. Or you can even use it in the background of a quilt if you have a quilt that has a lot of background, that's a great way to fill it in and just gives a little bit of interest to it. 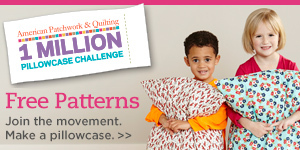 Here we have the same shapes just used in a different ways to really emphasize the geometric quilts that we do." "It's a terrific look. You've given us three great designs to look at, so have no fear. These designs will make geometry fun. And remember, it's hip to be square. 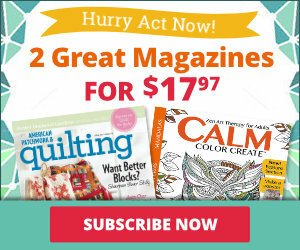 Have fun quilting!"